Do you ever wonder what your Labrador is getting up to when you leave the house? If there periods of time when your dog is left alone, then you might be interested in looking into a petcam. 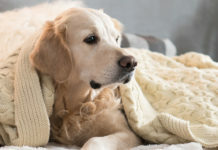 These pet monitoring systems can give you an insight into your dog’s day, but also allow you to find the best ways to keep him happy and occupied when you are gone. 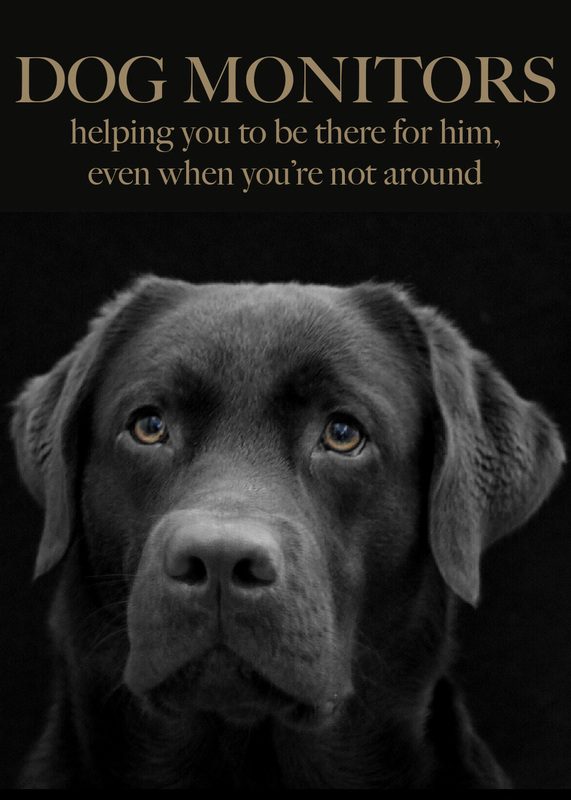 Finding out what your pet gets up to when you are gone will enable you to give him the best possible care, even when you aren’t able to be right next to him. 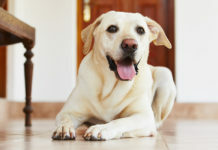 If you own and Labrador and have to spend time working outside the home, then you can feel concerned about your dog’s welfare. When you work, you need to have some sound management systems in place to make sure that your dog’s needs are being met. Dog walkers, dog sitters and help from friends are a huge support to working puppy parents. But with the best will in the world, there will be times that you need to leave your Labrador without companionship for a couple of hours. This is where a dog monitor comes into play. What Is A Dog Monitor? A dog monitor is a pet camera that allows you to watch your dog, even when you are out of the house. They generally work through your internet connection, and can be activated remotely. You leave a camera in your house pointing at the area your dog spends his time in alone, and this dog camera sends images to your phone or work computer. Allowing you to make sure that he is happy and relaxed where you have left him. There are a range of options out there when it comes to pet cameras. From simple solutions to high specification options, the range of dog monitors is extensive and can be a little overwhelming. 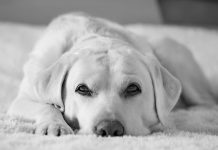 We have been looking at some of the most popular and well reviewed options on the market, to help you make the right choice for your Labrador Retriever. The Petzi Treat Dog Cam is a brilliant option for people who want to interact with their dog during their absence. It provides a 30Fps HD camera, delivering up to 720p video, that you can watch via a secure App. It also enables you to interact with the pet camera via the App. Releasing dog treats from a dispenser at the click of a button. The App functions on tablets and smart phones, so you can view it wherever you happen to be – as long as there is an internet connection. This is an ideal option for owners who are concerned about their dogs noise when they are out, as it allows you to see the extent of the problem and to reward him during his silences. Encouraging quieter behavior whilst you are out. You can even take photos using the camera remotely, as well as use a voice function to reassure your Labrador if he is worried. The treat dispenser and camera can be mounted on the wall, at a level that you choose to give the best view of your dog and his surroundings. It is at the higher end of the price range, but if you are looking for an interactive pet monitor then there are no shortage of recommendations for this model. 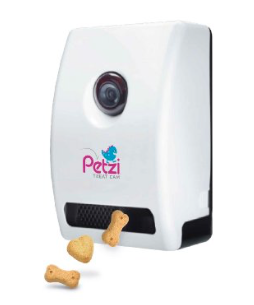 Find out more about the Petzi Treat Cam on Amazon here. The Petcube Interactive WiFi Pet Camera is a modern looking, functional dog monitoring system. It allows you to view live video footage of your dog in HD quality, recorded with a 138 degrees wide angle lens. It has two way audio capabilities, so you can speak to your dog as well as hear them. It also has a fun interactive laser toy to keep your dog entertained. 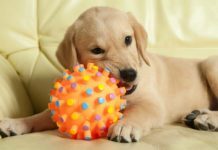 The video footage can optionally be accessed by multiple people, giving you the option of the entire family keeping an eye on your Labrador. As well as sharing fun photos and recordings with your friends. The Petcube is monitored and interacted with via a specialised Petcube Mobile App, that is supported by iOS as well as newer models of Android phone. Find out more about the Petcube Interactive WiFi pet Camera on Amazon here. The Sunmy Dog Camera is a multipurpose video monitoring system. 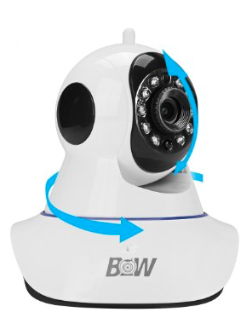 Designed to function as a pet camera, baby monitor or alarming security system. It has a great range of motion, and can even monitor your dog during hours of darkness using night vision. The design allows the camera to rotate up to 355 degrees horizontally, and 120 degrees vertically. Providing you with an extensive visual field to keep track of your Labrador. This pet camera also has the option of linking with your alarm system, smoke detector, gas detector or the alarms at your points of access. The rotation can also be automated, and is able to locate the position that the alarm is coming from. There is a built in microphone allowing two way audio communication, and multiple users can simultaneous watch the footage. This pet monitoring system would suit someone who is looking for added home security, and a great range of viewing angles. Find out more about the Sunmy Night Vision Pet Camera on Amazon here. The Ba Vision Pet Monitoring System is a wireless security monitor that works through your WiFi connection. It is quick and easy to set up, and gives you remote live video streaming that can function through smartphones, tablets and even desktop or laptop computers. The video is high quality HD, and their is also the capability for two way audio. Allowing you to communicate with your dog when you are out, to reassure or entertain him when you are gone. It also has a night vision option, which provides a good quality image. The camera can pan or tilt, horizontally by 350 degrees or vertically by 120 degrees. However, there is no digital zoom and you can only record your footage to the TF card. Functionally it is more limited than some of the other models, however it is also comparatively lower in price. The dog camera is small and discreet and review of the device are very promising for the features on offer. You can find out more about the Ba Vision Pet Monitor on Amazon here. 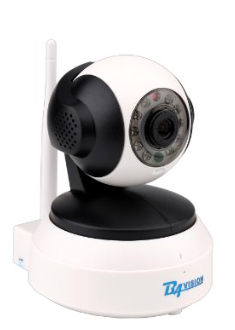 The Mini Monitors Wireless WiFi Surveillance Camera uses the free MiCam App to allow you to watch your dog wherever you are, using an iOS or Android device. 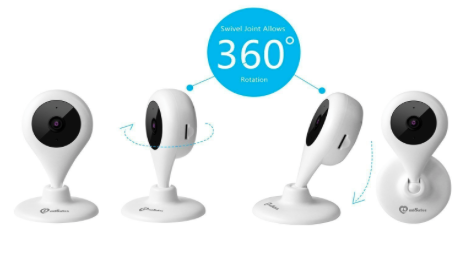 This small camera has a wide angle view of 120 degrees, and can pan around 360 degrees. You can also talk to your dog when he is home alone through the speaker. It has an easy plug-and-play set up, so it’s quick to install and get going. The base is magnetised to allow simple attachment to multiple household surfaces, without the need to permanently fix and therefore damage any of the structure of your home. They also come with an optional removable cover, it the form of a colorful animal shape. The camera doesn’t have night vision or two way communication, however it is cheap, small and very convenient to use. To find out more about the Mini Monitors Wireless Dog Monitor, check them out on Amazon here. 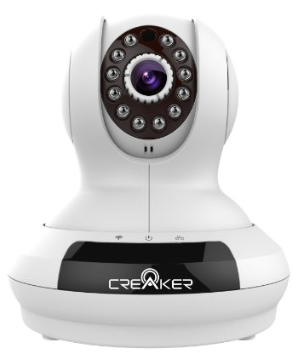 The Creaker Wireless Pet Video Camera is a high specification pet monitoring system. It has remote live video streaming, available not just through smart phone and tablet, but also through your PC or laptop via a web browser. The video is 720p HD quality. The camera also has 12 infrared LEDs for night vision recording. From your smart device you can interact with the camera, using easy touch sensitive movements on the screen. Panning 350 degrees horizontally and tilting up to 100 degrees vertically. You can also zoom in on the picture up to 4x. It also has a motion detection function, and snapshot alert, that you can use to notify you if you want to see when your dog wakes up for example. 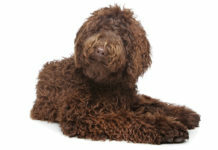 The camera also has two way communication functions, so that you can speak to your dog and hear him as well. Find out more about the Creaker Wireless Pet Video Camera on Amazon here. 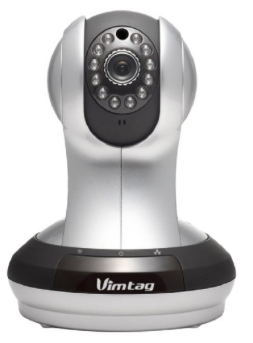 Vimtag Video Pet Monitors come in a variety of models, for both indoor and outdoor use. The version we have here is the indoor pet monitor . It works via remote live video streaming to your smart phone, tablet or PC. You view the video through Vimtag’s App, so whilst this can be accessed through desktop computers it is not possible to get a live web stream of the footage. The camera is however nice and function, with remote pan and tilt movements, and motion detection snap shots. It also has a three times zoom function, as well as night vision. The microphone and speakers are two way, so you can speak to your dog and hear them at home to monitor their noise levels. The camera itself needs to be plugged in to a power outlet, but the internet connection can be wired or through the WiFi. Setting up this camera should only take five minutes, and an SD card allows you to save and play back the footage it takes. This is not the cheapest option when it comes to a dog monitoring system, but it does have excellent quality HD video, and a very wide range of movement. Giving 320 degree horizontally and 120 degrees vertically. You can also image capture the video, to form excellent high definition photographs. To find out more about the Vimtag Pet Monitors, visit Amazon here. The Motorola Pet Scout Dog Monitor works on a different system to those reviewed previously. Rather than connecting to your smart phone, tablet or computer, this dog monitor has it’s own hand held video monitor. Depending upon your use of the device, this can have it’s pros and cons. The main downside is that the monitor and handheld device only connect up to 590 yards apart. This means that most people who want the monitor for whilst they are at work will find little use for it. However, if you want to watch your dog whilst you work from a separate home office, in an attached shop front, or simply to see what he is up to in the house or garden when you are in another area, this set up is a really good one. Because the set up includes both an indoor and outdoor camera, as well as a 3.5 inch full color LCD video monitor. From the monitor you can pan, tilt and zoom with the cameras, as well as viewing in infrared during the night time. The handheld unit runs on rechargeable batteries, so it does not need to be connected to a power outlet whilst you use it. It is especially well received by people who want to find out why their dog is barking in the night time, and will give the conscientious pet owner a unique insight into their dogs activities. To find out more about the Motorola Pet Scout Dog Monitor, click through to Amazon here. The best dog monitor is one that is reliable, gives a clear picture and can be easily accessed by you. Budget is another important consideration, as is frequency of use. 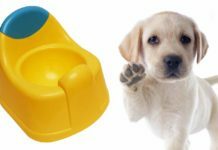 If your budget can stretch to it, a monitor which also dispenses treats is a sound investment that will help you to not only keep an eye on your Labrador, but to help entertain and train him while you are gone as well.